Our old aluminum bathroom window had an adhesive film on it for privacy. To be honest, it didn't look very good. 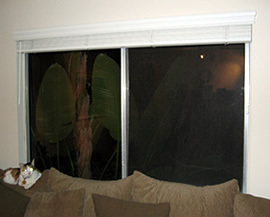 When we upgraded, to vinyl windows, we chose privacy glass with a "rain" pattern. 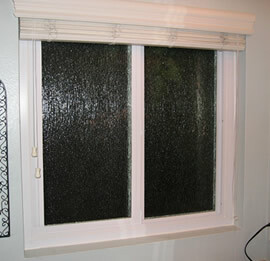 There are usually several different styles of privacy glass available. This is now one of our favorite windows in the whole house. Note that the thicker vinyl frame does reduce your glass area. The smaller the window, the more you will notice the reduced amount of light that gets into the room. Even thought this was the smallest window we replaced, the new window still lets plenty of light into the bathroom. The white vinyl of the new living room window looks cleaner and more modern than the old, stained aluminum. 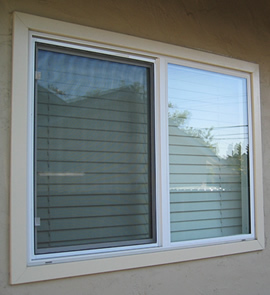 Since this is a large window, the reduced glass area of the vinyl window is barely noticeable. 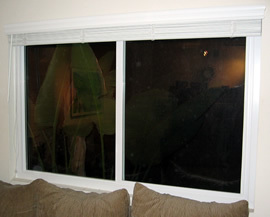 On big windows like this, switching from single paned to double paned glass makes a big difference in energy efficiency. 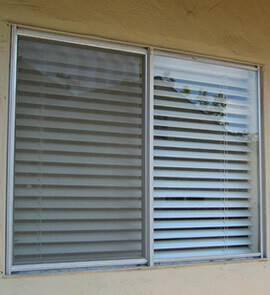 Note that the inset horizontal blinds work with the new window without any modification. This isn't always the case, so make sure to ask your installer if your existing window coverings will work with your new windows. 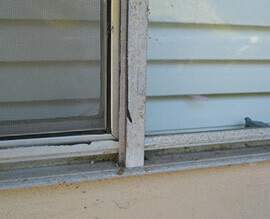 Our aluminum windows were old and dirty. The new vinyl windows give the house a much cleaner look. 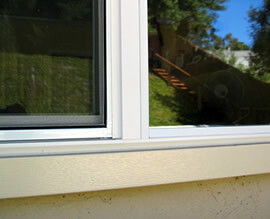 Here you can see the coil wrap trim that frames the window on the outside of the house. It has a simulated wood grain, but it's actually a piece of aluminum. It looks good, but since it's hollow inside, it is prone to denting. 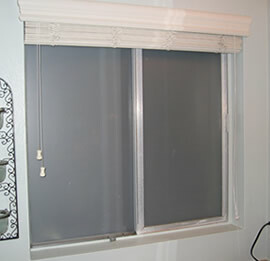 Here you see how vinyl windows can dramatically update the look of your house. The new windows and coil wrap trim really improved the curb appeal of our home. The double paned glass is helping us save energy too.